AST, a leading consumer market research firm uses TouchTrak to capture market research data from their network of kiosk locations in shopping malls, airports, and other high traffic locations. AST clients are able to set up and monitor activity and retrieve real-time survey results through the TouchTrak online dashboard. 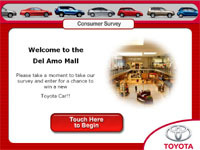 Targeted2020 provides marketing kiosks at high trafic event venues for corporations to assist them in capturing conumer data and direct marketing leads through surveys and contest registrations. Targeted2020 used the TouchTrak engine for all their survey deployments.